What skills do you need to become a data-driven storyteller? Join a week-long data journalism training #ddjcamp – Open Data Aha! This post is written by Anastasia Valeeva, data journalist and member of Open Knowledge Russia, one of the local groups in the Open Knowledge Network. 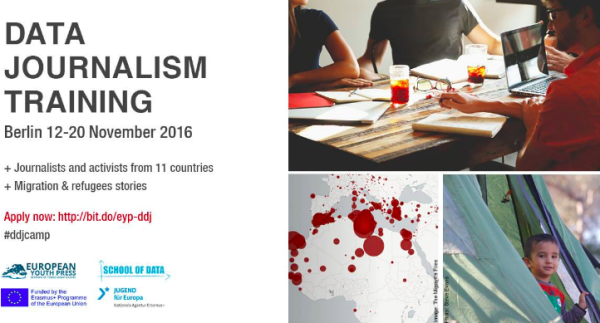 European Youth Press is organising a week-long intensive training on data journalism funded by Erasmus+. It is aimed at young journalists, developers and human rights activists from 11 countries: Czech Republic, Germany, Belgium, Italy, Sweden, Armenia, Ukraine, Montenegro, Slovakia, Denmark or Latvia. If you have always wanted to learn more about what it means to be a data-driven storyteller, then this is an opportunity not to miss! Our course was designed with wanna-be data journalists in mind and for people who have been following others’ work in this area but are looking to learn more about actually making a story themselves. Modern journalism now requires considerable cross-border communication and collaboration. Examples of TheMigrantsFiles and Panama papers are impressive; but how do you become part of such teams? ‹ Baby names since 1904: how has yours performed?